There once lived a shepherd who was known to be very hard working and committed to his flock of sheep. One fateful day he woke up to find himself down with a severe fever. He found it hard to move from his bed and as the day progressed, he became worse. His wife was worried as the flock of sheep started to bleat uncontrollably signalling that they needed to go out for food and water. Suddenly the shepherd’s little son, Davis, seeing his father’s critical condition offered to take the flock out to pasture. However, his mother objected at first saying that he may not be able to do the work. The boy assured his mother that he had learnt from his father and that he is capable of taking care of the flock of sheep and above all, he is personally connected to each and every one of them. Even his father from his sick bed confirmed that the boy could do the work very well. As Davis was going out, his father spoke from his sick bed and told him to stay close to the flock and not to leave them alone for any reason. His mother advised him to ensure that they were taken to the right place where the pasture is green and full so that they can feed well. His old grandfather who was sitting outside and who also supported him earlier, asked him to look out for the weak ones and give them support. His father spoke again telling him that he is the support and guide of the sheep and without him they will be lost. After all the instructions and reminders, Davis left with the flock. As he matched, they followed him. At some points he would stop to check if they were all doing fine. He called each by its name and it will respond by bleating joyfully. He met other shepherds on the way; often they passed each other with their flock but none of his sheep followed the other shepherds, not even by accident; they stuck to their leader. At some points also he would carry the weaker ones and they continued to match on to where the flock had enough green pasture and running stream of water. When the day was ending and it was time to go, Davis got the flock together. He was planning to go when he heard the sound of the royal drummers! The King was passing with a royal procession. It was not easy in those days to see the King. Some people spent their entire life on earth without seeing the King. Davis thought about seeing the King in person and how gracious it would be to tell the story back home. Davis saw the other shepherds leaving their flock and advancing to the hill from where they could see the royal procession. He wanted to join them when he remembered what his father told him: “stay close to the flock and never leave them alone for any reason!” And the second instruction: “You are the support and guide of the sheep without you they are lost”. He knew why his father said that; because of the wild animals; especially wolves. Davis’ thought was confirmed! As the others left to see the royal procession, a hungry wolf that had been hiding emerged from the bush and started going to attack one of the flock of sheep that one of the shepherds left behind. Seeing the wolf Davis gave a loud shout WOLF! WOLF!! WOLF!!! Instantly the other shepherds turned back and even the King and his guards emerged with their chariots and pursued the wolf and killed it. After dealing with the wolf, the King sought to see the boy who alerted everyone about the wolf. When the King learnt that he was able to see the wolf because he stood by his flock and not leaving them; he was pleased with him proclaimed him the King’s shepherd and the head of all the shepherds in the kingdom. How expedient it is for every shepherd to be constantly at the service of the sheep: parents, teachers, leaders, the government etc. Today being the fourth Sunday of Easter is known as the Good Shepherd Sunday. From the story we heard, we can recommend the little boy Davis for his thoughtfulness especially his decision to defend the flock of sheep by not leaving them alone to go and see the royal procession. 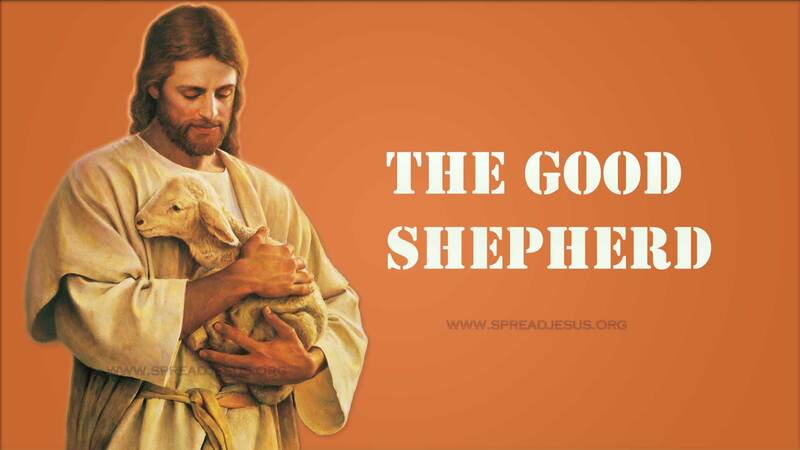 It is in like manner and more, that our Lord Jesus Christ declared today that “I am the Good Shepherd. The good shepherd lays down his life for the sheep”. Note well, he used the definite article “the”. This means that there is actually one good shepherd and he is the one. Our Lord Jesus Christ is the Shepherd with a difference because he is so protective of the sheep to the extent that he lays down his life for his sheep against any external aggression (John 10:15).Furthermore, this quality (the good Shepherd) is what our Lord Jesus Christ shares with God the father who is also known as the Shepherd of His people Israel (Psalm 23; Ezekiel 34:11-15). An attentive search into the bible would show that God preferred shepherd to take up most leadership roles. Practically all the Patriarchs were shepherds: Abel (Gen.4:2), Abraham (Gen.21:28), Isaac (Gen.26:14), Jacob’s sons (Gen.37:12) and Moses (Exo.3:1ff). King Saul and King David were Shepherds. Among the prophets some were shepherds like Amos. 1. Individual Knowledge of the Sheep: The Shepherd knows the sheep individually and even call them by personal names. He knows when they are hungry and feed them, he knows when each is sick and attends to it. Simply put everything about the sheep it comprehensively known to the Shepherd. When we relate this to the claim of our Lord Jesus Christ, we see that he is indeed the GOOD SHEPHERD PER EXCELLENCE. He knows us personally; Isaiah (49:16) says our names are written on the palms of his hand. He feeds us when we are hungry not only with physical food (Matt.14:13-21), he also feeds us with spiritual food; his body and blood (John 6:54). He is further attentive to us when we are sick physically and spiritually (Matt.9:5-10). Leading the Sheep to Right Spots: It is one thing to lead others and another thing to lead them to the rightful places. Most people are lost today because they were led to the wrong places by those they depended on. A good Shepherd is one who knows the best spots for the sheep and leads them there (Psalm 23:1-2).This is one of the greatest attributes of our Lord Jesus Christ who came to lead us into eternal life (John 12:50). 3. Defending the Sheep: Without a shepherd the herd of sheep is defenceless and susceptible to destruction by enemies. It is thus the work of the shepherd to see to it that the sheep is protected. This is a superlative work of God as we learnt from David (Psalm 23:4) where he says: “Even though I walk through the valley of the shadow of death I fear no evil, for there you are with me; your rod and your staff they comfort me”. In appropriating this role of the Good Shepherd which he shares with God the Father, our Lord Jesus Christ in the gospel today maintained that the Good Shepherd stands to defend the sheep against intruders. This simply means that he is apt as the Good Shepherd in defending and protecting the sheep. One peculiar thing about our Lord in this role is the fact of laying down his life for the sheep; dying so that the sheep could live (John 15:13). Maintaining Unity Among the Sheep: A discordant Shepherd cannot have a coordinated and united herd. Real unity is not a mechanical act of fixing and re-fixing. It comes from genuine disposition of fellow feeling. The Shepherd sees to it that he is one with the herd and that the herd is also united as a community. On this account our Lord Jesus Christ prayed for unity and oneness among the sheep as he is one with the father (John 17:21). He further anticipated the convergence of all under one herd and one Shepherd (John 10:16). Attentive listening: the sheep that belongs to me listens to my voice (John 10:27). Being attentive to the word of God is life. Willingness to follow: The beauty of listening lies in following. That invitation that was given to the fishermen still resonates today: follow me and I will make you fishers of men (Matt.4:19). Unity with the shepherd and the other sheep: We cannot individually make up a flock. This means that our unity is our identity in the Second Reading today the apostle John rendered the identity as CHILDREN OF GOD. Our Lord did pray fervently for this unity (John 17:21). Corrigibility: Sheep are known be flexible when it comes to accepting corrections. As sheep of the Lord the Good Shepherd there is need for us to always accept corrections and being ready to retrace our steps. Have a glorious Fourth Sunday of Easter.